The new Accord is new from the ground up. It rides on a modular chassis that it shares with the CR-V and the Civic that promises increased stiffness and rigidity while also cutting weight. 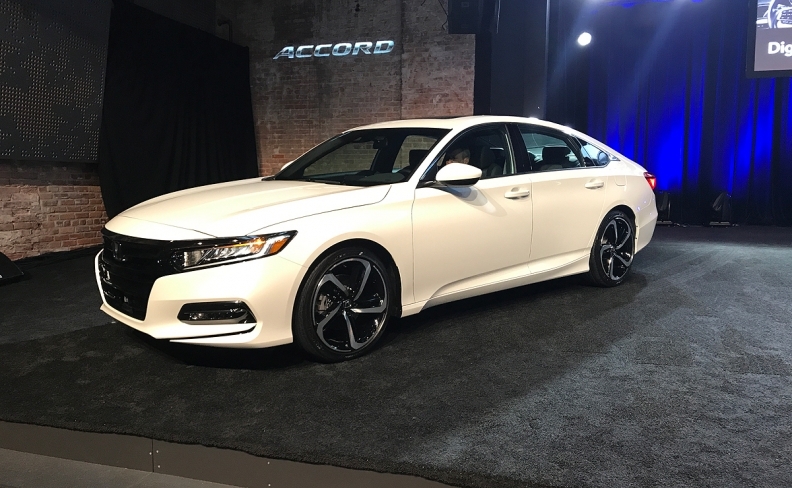 Honda has taken the gloves off in the battle of cars vs. crossovers by introducing a redesigned 2018 Accord sedan that promises crisp styling, a trio of modern powertrains and numerous upscale features. The 10th-generation Accord, introduced Friday morning in Detroit, will go on sale later this year. It will face stiff competition not only from a thriving crossover market but also within the ranks of family sedans, a segment that's in a slump in Canada and the United States, yet getting more competitive. A redesigned Toyota Camry and a refreshed Hyundai Sonata recently hit the market while a redesigned Nissan Altima is expected next year. The Accord has long been the cornerstone of Honda's lineup. The automaker sold 13,857 units in Canada in 2016. The Civic, which sold 64,552 units in 2016, remains Honda’s best-selling car in Canada. Meanwhile, sales of the CR-V — a record 44,789 sold last year — far outpaced those of the Accord. Even the HR-V gained ground, with 12,371 sold. ”We are redefining the Honda Accord for a new generation of buyers by bringing something unexpected that challenges the idea of what a mainstream sedan can be," Jeff Conrad, senior vice president American Honda Motor Co., said in a statement. Yet the Accord, like its contemporaries, will have an uphill battle in persuading buyers to choose sedans over utility vehicles, which have virtually eliminated the gap in fuel efficiency, cost and ride quality in recent years. "The major challenge to the new Accord is the market shift to crossovers that has hit the midsize sedan market hard," said Jack Nerad, executive market analyst at Kelley Blue Book. "So while we expect the new Accord to be a technological, design and engineering success, it's unlikely to be the sales success that its predecessor was." It won't be for a lack of trying. Like the current-generation Civic, the Accord is new from the ground up. It rides on a modular chassis that it shares with the CR-V and the Civic that promises increased stiffness and rigidity while also cutting weight. For the first time, the Accord will be available with a turbocharged engine. The base model will have the 1.5-litre turbo four-cylinder used throughout Honda's model lineup. It will make 192 hp and 192 pounds-feet of torque and will be matched with a continuously variable transmission. Honda will drop the longstanding V-6 as the Accord's optional engine and instead offer a 2.0-litre turbocharged four-cylinder. Based on the engine in the Civic Type R, this unit makes 252 hp and 273 pounds-feet of torque. It will come with a new 10-speed automatic gearbox. A short-throw six-speed manual transmission will be available on the LX 1.5-litre and Sport trims with the 1.5-litre and 2.0-litre engines. A revised two-motor hybrid model -- now built in Honda’s Marysville Ohio plant -- will use a 2.0-litre gas engine. Additional details on the Hybrid and fuel economy for all new models will be released closer to the 2018 Accord’s on-sale date later this fall. Honda was keen to wrap these new powertrains in a body that had more style than earlier, more conventional Accord models. Despite being a true sedan, the 2018 Accord has a sloping, fastback profile that echoes the silhouette of the current Civic while also bearing a family resemblance to Honda's Clarity lineup. The new Accord is bigger than its predecessors in nearly every dimension. Its wheelbase is 2 inches longer (though the overall length shrinks by 0.39 inches, effectively pushing the wheels farther towards the corners). Inside, rear legroom grows by 2.5 inches, passenger volume is up by 2.5 cubic feet to 105.7 cubic feet and trunk space grows by just under a cubic foot to 16.7 cubic feet total. The 2018 Accord sheds between 110 and 176 pounds, depending on the trim level. Much of these weight savings are due to its modular chassis, as well as the use of aluminum in areas like the front subframe and suspension and ultra-high and high-strength steel throughout. All 2018 Accords will come standard with HondaSensing, the automaker’s suite of safety tech. This includes pre-collision braking, adaptive cruise control, lane-keep assist and blind-spot monitoring. Inside, Honda revised the Accord’s dashboard to include a new eight-inch touchscreen infotainment system and a seven-inch digital screen in the instrument panel. A six-inch heads-up display is a new option. Wireless phone charging, 4G LTE Wifi and over-the-air system updates -- first used by Honda in its recent Odyssey -- will also be available. The trim levels of the 2018 Accord will largely echo those of the outgoing model. The 1.5-liter models will come in LX, Sport, EX-L and Touring in Canada. The 2.0-liter models will come in Sport and Touring. The new Accord Hybrid will be available in two trims – Hybrid and Touring. The 2018 Accord will hit dealerships later this fall and pricing will be announced closer to that time. When it does arrive, the industrywide reach of the Accord could lift the tide of all midsize sedans, similar to the success the current Civic had when it came out.